If you refer 1 or more account in a month, you will receive $25.00 for every referral (including your first 1). If you refer 6 or more accounts in a month, you will receive $50.00 for every referral (including your first 6). If you refer 16 or more accounts in a month, you will receive $75.00 for every referral (including your first 16). If you refer 20 or more accounts in a month, you will receive $100.00 for every referral (including your first 20). You may NOT receive commission for referring yourself to MultipleCloud. The hosting account must have been active for at least 90 days. 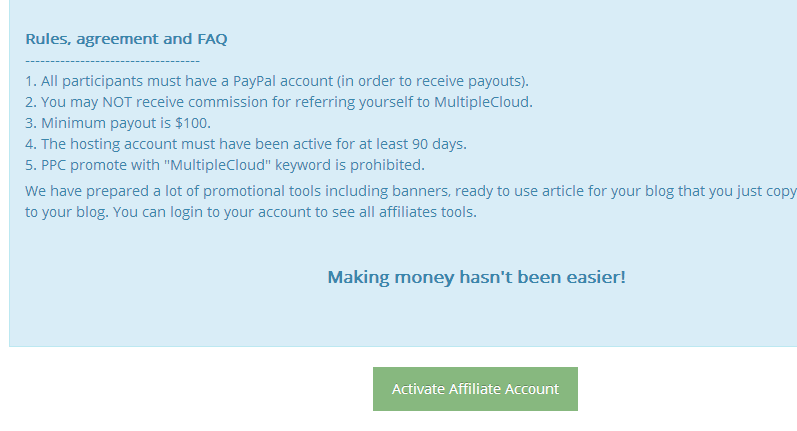 PPC promote with “MultipleCloud” keyword is prohibited. Read an affiliates detail and scroll to the bottom, then click on button "Activate affiliate account"
Let us know if you need further help from us!